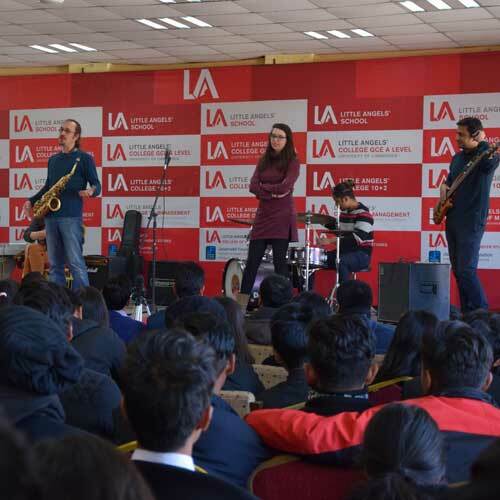 Our mission is to increase the standards of music education in Nepal and seek to be at par with any international organization. We do what we can in Kathmandu but our ultimate goal is to have the same standards throughout our country. Everything has a first step, so the beginning of this can be seen with the partnerships we have formed in the schools of Kathmandu. Many of them use the book that we have developed specially for Nepal. Many of the books that are used for the schools in Nepal are designed for India and they do not include many key cultural nuances that are native to our country. This book has been developed by Albertina Barcelo, who is an expert in pedagogy and music education for children co-authored by Bhintuna Rajbhandari who is our resident head of the Children’s Department. Little Angels (LA) is one of the schools that we work with. We are spear-heading the music program there. Every once in a while we have the opportunity to expose these kids to high level international music because we happen to have new faculty here at the conservatory. There isn’t much access to quality live music for the children in Nepal so it is always a pleasure to see the reaction of these kids. We have many international artists coming to our school throughout the years. In 2016 and 2017 alone, there have been more than three dozen artists coming in from all around the world. We have many artists in our school at this moment so we took the opportunity to organize a concert in the school premises. The children went crazy! Even our staff were cheering because they hadn’t heard our new faculty play together like that before. It’s all in the ambience of the room. The energy from the children was just contagious and spread throughout the hall like wildfire. We are glad we could share this moment of inspiration with the kids and the LA team. If you are a school and want to enroll with us for our services please connect with us at info@katjazz.com.np. You will see the difference.